Before any other two players duel or compete, he can replace either of the two combatants. If he wins, he recovers one blood. Li Ru can use any diamond as an attack. Any hand card with numbers between two and six can be used as duel. 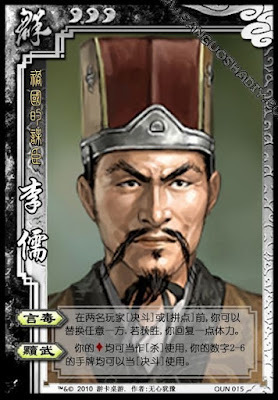 When Li Ru takes over a Duel or Compete, all the abilities of the replaced player are rendered useless. Li Ru can use diamonds that are both from his hand or equipped.